Discover this incredibly beautiful and diverse country. Dubrovnik, Zagreb, Split and Zadar are among the fabulous cities reflecting its rich culture with many UNESCO World Heritage sites. You will be transported back in time when strolling through winding stone-paved streets and squares. Enjoy one or more of the 8 national parks. Forests rich in vegetation, cascading lakes and beautiful travertine waterfalls create a masterpiece of nature. Also visit the fabulous Croatian Islands caressed by the sun, gentle breezes and aromas of pine and lavender filling the air. Enjoy the fabulous beaches with their crystal clear blue sea should not be missed! Private transfer to your hotel. Split is the most important town in Dalmatia. You can visit the Diocletians’s Palace (UNESCO site), built between the late 3rd and early 4th centuries A.D. You can walk among the Romanesque churches, medieval fortifications and Gothic palaces. Split is a city with rich history, not only within the walls of its museums, palaces, and churches but in the city itself. Enjoy a private walking tour of the historic center of Split, the most important town in Dalmatia. Visit the Diocletian’s Palace (UNESCO site), built between the late 3rd and the early 4th centuries A.D. Walk among the Romanesque churches, medieval fortifications and Gothic palaces. Transfer to the port for the catamaran to Brac Island. Upon arrival, transfer to hotel and overnight. Day at leisure in Bol, the oldest settlement in Brac. 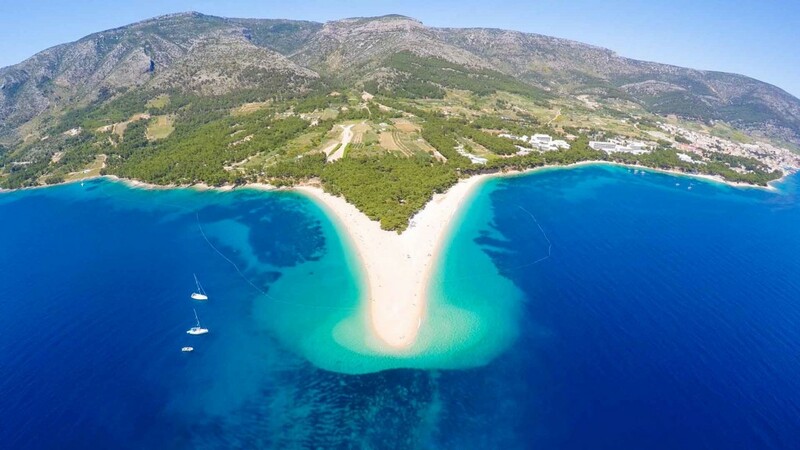 Enjoy the famous “Zlatni Rat” Beach, also known as the “Golden Horn”, the most beautiful in the Adriatic! Supetar, the island's main town, offers a horseshoe-shaped beach and ferries to and from Split. Seaside Pučišća features traditional architecture and an active quarry for the island's famous white limestone. Transfer to the port for a hydrofoil to Hvar. Transfer to your hotel. The island of Hvar is the sunniest of the Croatian islands. It is known for its natural beauty – beautiful sandy beaches, peaceful secluded bays, vast fields of lavender, ancient olive trees and vineyards – and a fabulous nightlife! It is famous for both its Aloe lace (under UNESCO protection) made by Benedictine nuns and the lavender produced there. The main town is dominated by the fortress perched high on a hill overlooking the town. Days at leisure. Visit the Cathedral of St Stephen, the Arsenal, and more. Explore towns filled with history and charm – Stari Grad, Jelsa, Sucuraj, and Vrboska. Take a water taxi around Hvar or to Palmizana Island to enjoy a day at the beach and a fabulous fresh fish lunch! Or take a tour to the blue and green cave known for its beauty! You may also visit the island of Vis or Brac for a day cruise. Hvar is also known for its jetset night life. Transfer from hotel to the Hvar port for the catamaran to Korčula Island. Upon arrival, transfer to your hotel. Overnight in Korčula. Day at leisure. Korčula is considered to be Marko Polo’s birthplace and before that home to one of the Homeric heroes. This quaint island offers secluded little bays to escape to, unspoiled natural gems to see and is characterized by red-roofed homes. Transfer to the port and take the ferry to Dubrovnik. Upon arrival, transfer to your hotel and overnight. Dubrovnik is considered the pearl of the Adriatic Sea and is a UNESCO city. Once, it rivaled Venice, as a maritime power. Thanks to its geographical position, it was considered an important city of commerce in Europe for thousands of years. This ancient city, surrounded by ramparts and fortresses, is full of architectural and cultural masterpieces. The old city walls are 6,364 feet long. Wonder amid the maze of narrow cobbled streets, wide squares with fountains, palaces, magnificent churches, markets, bazaars and restaurants and step into an age long gone and forgotten! Enjoy a private walking tour of historic Dubrovnik. This ancient city, surrounded by ramparts and fortresses, is full of architectural and cultural masterpieces. See the Rector’s Palace and the Dominican Monastery. Walk down the central city street, Stradun, and visit the Franciscan Monastery as well as other intriguing sites. Afternoon at leisure.